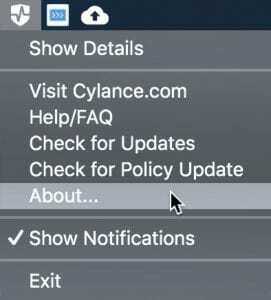 Back in September, just days before the release of macOS 10.14 Mojave, we recommended users to not update due to a serious compatibility issue with our CylancePROTECT anti-virus software that would cause the computer to deadlock upon reboot. We are happy to announce that with CylancePROTECT version 2.0.1494.546 and higher, the issue has been resolved. In the About window, verify the version is 2.0.1494.546 or higher. If the number is not higher, please contact the IT Help Desk at 214-768-HELP about getting the latest version of CylancePROTECT. If the number is higher, feel free to update to macOS 10.14 Mojave – unless you are a user of FileMaker Pro. If you use FileMaker for your role, you will still need to refrain from upgrading your Mac. We have found that FileMaker 14, the standard on campus computers, is incompatible with Mojave. Only FileMaker Pro 17 Advanced and FileMaker Server 17 are supported on macOS Mojave 10.14 with a few know issues. All other versions of FileMaker are not compatible with macOS Mojave 10.14. The known issues with FileMaker Pro 17 are not critical and are to be addressed in an upcoming update. To find out more about these known compatibility issues, please see FileMaker and macOS 10.14 Mojave compatibility. Next Next post: Check Out Tech Tip Tuesdays in January!